Obama Out! Mr. Man Dropped the Mic like a hot potato! NB Commentary: Mr. Man dropped the mic, on purpose, I felt it hit the floor. I know he is ready to get the hell out of dodge!! After effortlessly roasting people like Ted Cruz and Bernie Sanders, Barack Obama ended his speech at the White House Correspondents Dinner the way we all wished he would, with a presidential mic drop so powerful that Donald Trumpcould feel the impact blow off his hair system from hundreds of miles away. 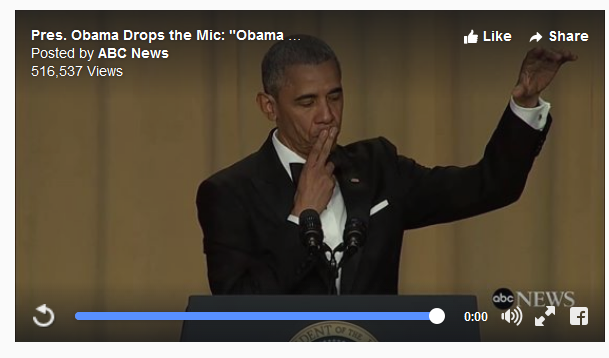 This immediately iconic mic drop came after the most earnest moment in his speech, where he thanked the correspondents for “working to push to shine a light on the truth” and helping him “strengthen democracy.” “With that I have just two more words to say,” he prefaced the move, “Obama out.” Then he dropped that mic like it was the Cuba embargo. The moment had been a long time coming, as his final year in office has seen a change in him that supporters have pushed for since 2008. Whether it was asking if “folks want to pop off,” getting Game of Thrones screeners sent to him early, inviting everyone’s favorite rappers to the White House, or getting coffee with Jerry Seinfeld while still doing his duties as commander in chief, Obama has been living his last year with swagger. It is a bittersweet moment to see President Obama give us a GIF that is the ultimate sign off knowing that whoever comes after him will have big shoes to fill, in the comedy department at the very least. In a highlight from his speech, Obama subtlety gives an idea of who he thinks is our next president by saying, “Next year at this time, someone else will be standing here in this very spot, and it’s anyone’s guess who she will be. Louis C.K. – You cant take a People’s historical context away from them.